It’s time for my traditional yearly post about the dynamics of “modern” money (fiat) compared to the “old” or “perpetual” money (gold) in the current year. 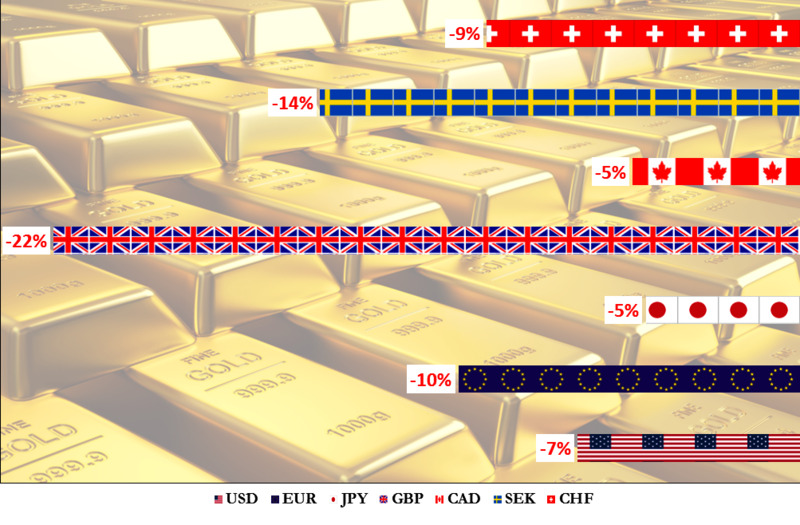 Fiat money is represented by 7 currencies: US Dollar (USD) and 6 components of the US Dollar Index (DXY) placed by weight: Euro (EUR), Japanese Yen (JPY), British Pound (GBP), Canadian Dollar (CAD), Swedish kKrona (SEK) and the Swiss Franc (CHF). Before we get down to the results of 2018, let us see how did you see the future back at the end of December 2017. 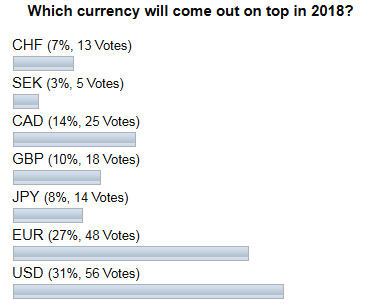 The most of you bet that the king currency (USD) would beat all the rest in 2018. Your second favorite is the single currency (EUR), which is the top rival of USD. There could be at least two reasons for this ballot result a year ago. The first one is more obvious and is coming from the country distribution of the INO.com web traffic as more than half of it comes from the United States. 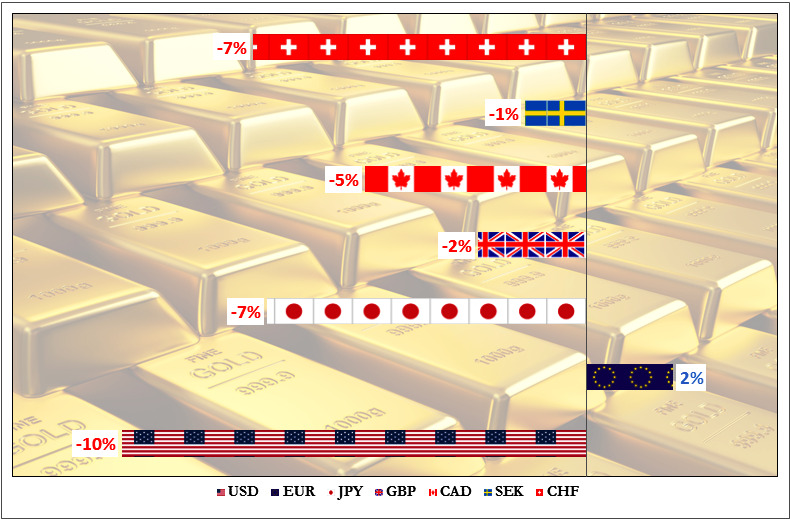 The other reason is also logical as the US Dollar was the top loser last year with -10% and you could bet on it using the knowledge about the “Pendulum effect”, which pushes laggards to the top. At the end of last month, I called for a substantial upcoming weakness in crude oil as the market could have finished the long-lasting consolidation after the earlier crash from 100+ levels. Indeed, oil lost almost $4 from that time and now is rebounding as markets naturally move in zigzags. Oil-related currencies also suffer, and in this post, I would like to share with you an exciting chart setup with tremendous profit potential for one of such currency, the Canadian Dollar (CAD) also known as “Loonie” among traders. Before that, I built a chart to demonstrate the correlation between WTI crude oil and the Canadian Dollar. The much-anticipated OPEC deal to cut oil production has finally been reached. Brent and WTI Oil futures were not too late to react and jumped more than 7% with Brent Oil futures surpassing the $50 mark. And if momentum continues we could very well be looking at $60, perhaps rather soon. If that is the case, this can change the picture, not only for Oil futures and Oil companies but for currencies of Oil exporting countries, many of which were hit hard when Oil prices took a nose dive and could benefit now that oil prices are taking off.